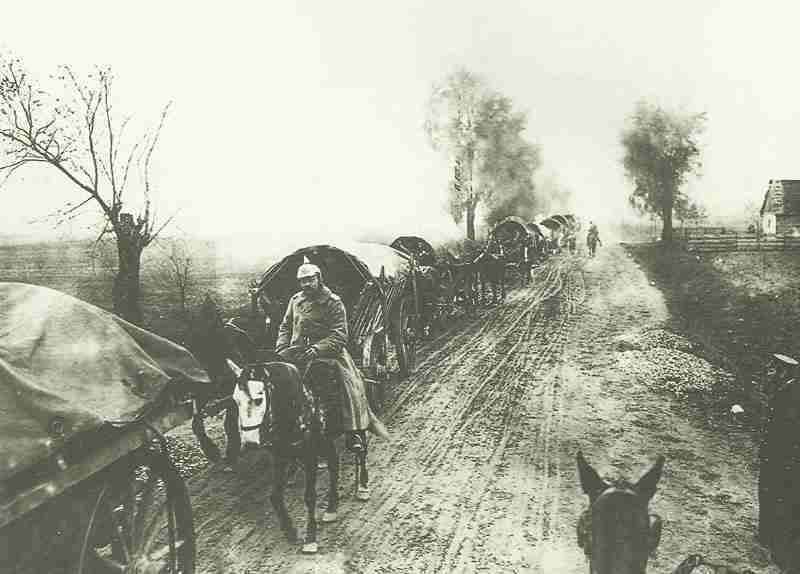 A Transport column of the new German Ninth Army is moving forward to protect Silesia and Galicia from a Russian attack. Belgium: Belgians appeal to Allies for help at Antwerp. Artois: ­French troops re-enter Arras. General Maud’huy given 4 divisions and I Cavalry Corps of Second Army to operate to north as Tenth Army from October 4. Poland: New German Ninth Army advances 10 miles per day against Novikov’s cavalry and entrenched south of Kielce. Bosnia: Indecisive fighting at Vlasenica until October 1 involves Serb 2nd Sumadija Divison. Egypt: British regular garrison (4 brigades, 1 cavalry regiment, 12 guns) sails for France from Alexandria. Germany: Army Air Service adopts black ‘Iron Cross’ insignia for its planes, airships and kite-balloons. Western Front: ­First British single-seat fighter plane with fixed armament appears: Bristol Scout ‘B’ of No 3 Squadron RFC armed with 2 rifles mounted at 45° either side of cockpit. Germany: Unemployment falls to 15.7%. Decree forbids money payments to British Empire.